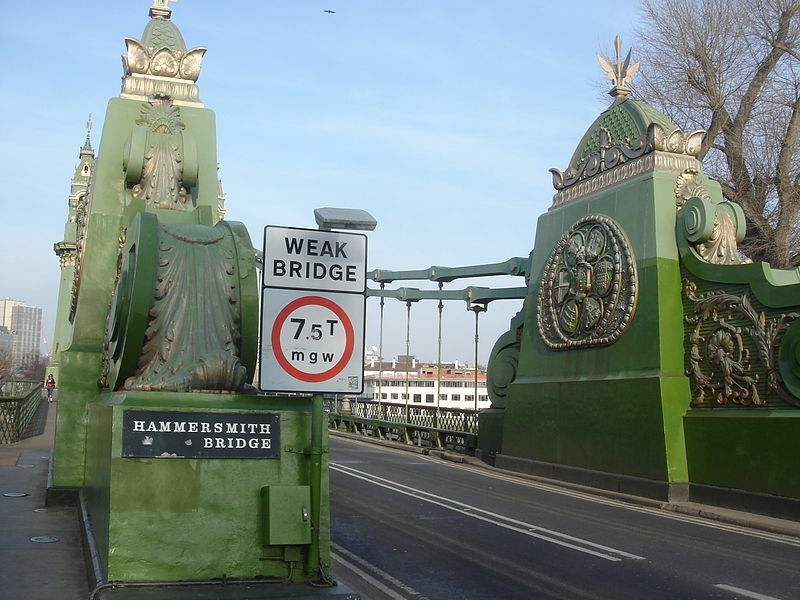 What colour should Hammersmith Bridge be? “Despite recent emergency closures, the bridge is due to be completely closed next year for a more radical overhaul and strengthening to allow double decker buses to use it again. (They were banned when there were previous structural problems). Our understanding is that this work is likely to take six months from next summer. The works will also involve repainting (and relighting). When it was last repainted, many lamented the loss of the more decorative treatment in pastel colours by the London County Council. The replacement in what many people refer to as Harrods green came about after studies of the original paint scheme by Sir Joseph Bazalgette in 1887 and was strongly advised by English Heritage. A new lighting scheme was also installed by the Council and which won a Hammersmith Society Environment Award in 2001, but the deck lighting has proved unreliable and difficult to maintain. The Hammersmith Society Committee feel that there is an opportunity to revisit both the colour and the lighting and that an exciting way to explore possibilities would be for an open competition : We would be happy to organise this but obviously there would need to be agreement with both the Council and TfL who are funding the main project. “On the subject of Hammersmith Bridge I welcome plans for an overhaul of arguably London’s most beautiful river crossing. Personally I would not open up the question of colour scheme. The existing green and gold scheme is both historically accurate and beautiful. I understand the bridge spent the first year of its life in 1887 in a pale pink undercoat before being painted green in 1888, which may have implanted a folk memory that this was its ‘correct’ colour. 1) Will the overhaul include a full strip/gritblast of very many existing paint layers as in the case of the restoration of Tower Bridge completed 2011? 2) There are actually two distinct shades of green in the scheme – a bright acidic green at lower levels and a dustier bronze green elsewhere. Is this intentional/correct or just the result of a partial and poorly matched repaint? Which one is Bazalgette’s colour? This entry was posted in Environment, Transport and tagged Hammersmith Bridge. Bookmark the permalink. ← Why won’t H&F Council publish property developers viability assessments? Keep the bridge green and gold. Oh please let’s not change the colour of the bridge it’s beautiful the way it is, leave it green . Keep the bridge in its original colours but I storngly support restoring the large heraldic shields to their original many colours – indeed it was a bit of an outrage that they were painted out. Green and gold. The bridge and its colours are iconic. Flying in from any part of the world I can see my iconic Hammersmith Bridge. Leave the gold and green alone! I was convinced a terrible mistake had been made when it appeared that the tide had risen and left its heavy mark of deep green Thames mud on the pillars. Apparently it was intentional! Apologises in advance, but IMHO it’s pretty gopping and has been for the last 25+ years. Bazalgette was good at sewers, and should have left colours to others. Perhaps we can compromise and have blue, white and gold ? I always assumed that the green and gold came from the proximity of the nearby Harrods Depository. Let’s leave the pale pastel shades to Albert Bridge. Striking colours for a striking bridge! Love the green and gold and if its historically accurate, why change it?? In view of the latest shelving of the garden bridge, the monies that have been accrued should be spent on Hammersmith Bridge as soon as possible. Normally I would support a scheme for original colours, but the green is a bad choice and has faded badly over time. A colour less prone to fading would be more desirable. I remember the previous scheme of gray or taupe with gold highlights and it was much better. How about contrasting tones of grey/green with white and gold highlights?